Since we published our 2013 E-Expectations report and I have presented on the findings, I have been thinking and talking a lot about how our campus partners can use the data to inform their strategic plans for recruitment marketing communications. Our first goal in producing the E-Expectations research and analysis is to provide insight to our clients and the community regarding the habits and preferences of college-bound students. Do our Web sites meet their needs and expectations? What digital resources are most useful? Which channels work best for delivering messages that build brand and encourage engagement? 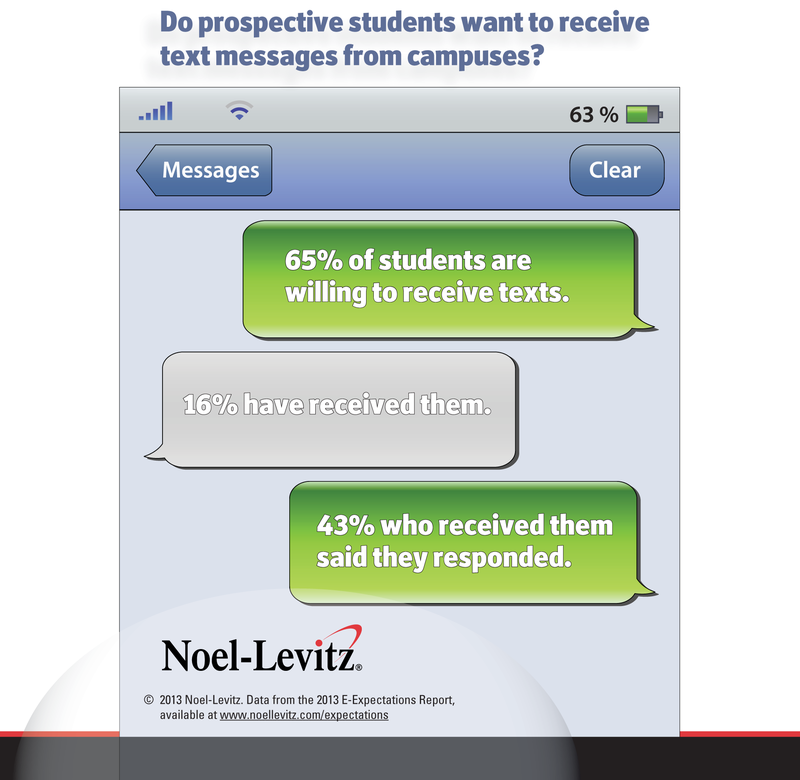 Notice the disparity: two-thirds of students are willing to receive text messages, yet fewer than one in five reported receiving one from a campus. The numbers in our 2013 Marketing and Student Recruitment Practices Report, while better, show most campuses ignoring this opportunity as well. Only about half of four-year private campuses and a third of four-year and two-year public institutions reported using text messages as a recruitment strategy. Why not? We did not ask that question, but as we see text messaging gain much wider acceptance as a channel for communication, I am reminded about the arguments about the validity of e-mail messages as a key element in a recruitment communications flow. Now e-mail communication is assumed as a key element in our overall e-recruitment strategy. About a dozen years ago, not everyone thought this was the case. Some of you might argue that e-mail is on its way out as a communications resource, but I encourage you to look at the data—80 percent of all students in our study use e-mail on a regular basis, 93 percent will give your admissions team an e-mail address, and 47 percent are checking their e-mail on a mobile device EVERY day. Let’s look at some other results from E-Expectations that uncover additional potential opportunities campuses may be missing. Live Webcasts and Webcam-enabled chats aren’t nearly as popular as the traditional campus visit, college fair, or good old e-mail message, BUT for roughly two-thirds of our sample, these methods hold value. We have some clients who have piloted projects that demonstrate students (and their parents) are interested in using these channels. While the volume of participants may not be impressive, the outcomes from these experiences are exciting. For example, a client hosted a Webcast focused on financial aid and scholarship programs and noted that a significant number of the participants were not in the current inquiry pool. Of these folks, all went on to complete an application for enrollment following the event. The idea of adding more communications channels to manage and track is daunting, but I encourage you to think about the pilot as an opportunity to try out new tools and strategies and compare results with more traditional methods. 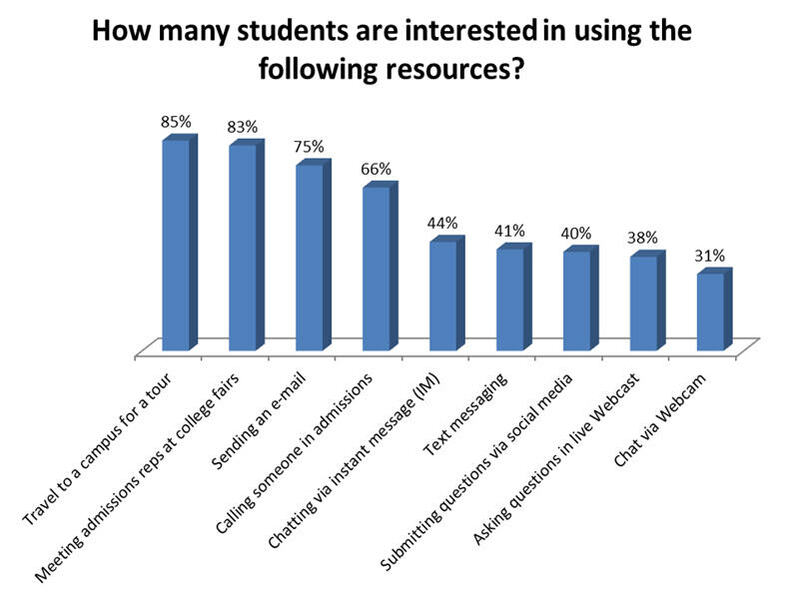 I also suggest that you research your own prospective students and find out what they prefer. Even if you have a medium where only 30 percent of students say they will use it, remember that is still A LOT of students, and that some of these communication methods may become commonplace in the future. It was only a dozen or so years ago that e-mail was “on the horizon.” Now it is an absolute necessity. Staying ahead of communicating with prospective students is one of the best ways you can stay ahead of your competition. How can you conduct your own research on prospective students? Build a balanced e-communications portfolio that uses multiple communication streams to your advantage? E-mail me and I will gladly suggest strategies that are working for other campuses out there.